The prospect of finding love again can be… scary. Being able to trust, give and share your life after 50 may often seem more like a dream than a real option but that is why sites like LoveAgain.com, who cater to seniors looking for that special someone, are around. The easy multiple choice questions are great because and instead of having to fill out lengthy responses, it lets you just click the circle with your answer. It is conveniently located towards the top half of the screen and this simple process makes it fast and easy to round out one’s profile without having to go into many screens or too much detail. Using the chatroom feature, multiple members can speak and be engaged at the same time. Chatrooms can be organized by subject or just be an ‘easy chat’ for getting to know people and are useful in all situations; whether you’re looking for friends, want to discuss a certain topic or even to learn about how someone you are interested in behaves in a group setting. 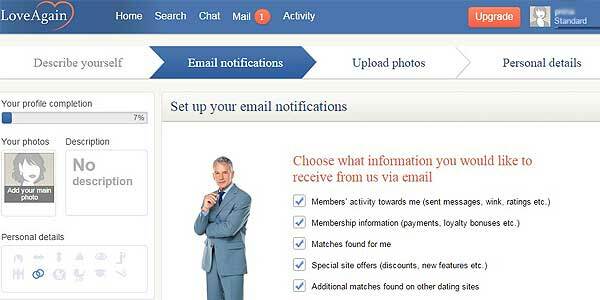 When you have completed your online profile, you are able to begin chatting with members right away. The ability to chat with someone who’s online right then and there is a great way to break the ice and get right down to getting to know each other with no need to send emails and wait for a response. Members’ safety and security is a priority for LoveAgain which is why not only are members required to confirm their membership with a valid email address but there are various dating tips on how to date online in a safe way. You can also explore additional dating tips to help you navigate the online dating scene for seniors. The loveagain.com login is quite simple: Click your gender, age, email, postal code and password. Contrary to other sites, loveagain.com asks you to agree to its terms on the sign up page. Whereas many websites will flood your inbox with messages, LoveAgain asks which information you would and wouldn’t to receive via email so as to not bombard you with unwanted information. In addition, uploading a photo is also a process made simpe. 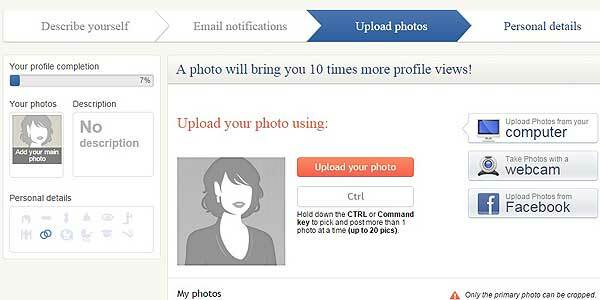 LoveAgain shows you how to either choose a photo from your computer or Facebook or use your webcam to snap a picture right on the spot. No need to search your files for pictures anymore, since you can just take one on the spot. Love Again dating site also offers the option to skip any of the signup process if you are unsure or simply want to complete it later. With the standard membership, you can upload a profile and video, and search through all members for free. The paid membership will allow you complete access to all elements of the site – chat, messaging and others. Like other great sites geared for older singles, LoveAgain knows that finding love again when you are older can sometimes be difficult. That’s why the site is easy to use with step by step instructions on how to navigate throughout. The top bar menu is very clear and allows you access to all of the different elements and features of the site in a single glance. LoveAgain also offers a live chat help option, should you ever need guidance with this dating website. Keeping love local is especially important if you want to be finding love again at 50. LoveAgain will find matches for you based on your geographical location so that you’re not starting to build a relationship with members living oceans away (unless that’s what you want, of course). Simply enter in your area code and the system will generate matches with those living up to minutes away! Search categories are divided by gender, age, location and can be broken down even further in an advanced search to add ethnicity, ‘looking for’, smoking/non-smoking, eye and hair color, build, height, relationship status and sexual orientation. The results can then be sorted by age, location, most desirable and last visit. To maximize your profile views and matches, make sure to fill out all elements of your profile, choose a picture that best portrays who you are and if possible, add a video. This will really give those out there a detailed look into who you are and what you are looking for, as well as increase your profile views and how you come up in searches. Love Again is a dating website that focuses on finding that one special someone in the 50+ age bracket who shares your interests and geographic location. Similar to other sites that cater to seniors looking to rejoin the dating pool, like other top dating sites for over 50, Love Again offers various means to meet the match you’re waiting for. Whether it be narrowing down the search to view people located near to you or the option to upload a personal video, the options are numerous, thus increasing your chance for finding love again. When starting the next chapter in your life, dating should be simple and accessible. Love Again offers a user friendly and targeted opportunity to connect with singles who share common interests. If you are older and looking for love, turn to Love Again to help make your future a fulfilling one. Read our main LoveAgain Review.